Home security cameras in Sydney used to be reserved exclusively for the rich and famous. While the rest of us relied on deadlocks, door chains and high fences, classic movies showed slowly pivoting security cameras serving up grainy footage of the person at the gate to a large and disinterested security guard. How far we’ve come. Like many technologies irrevocably changed by the digital age, home security has gone from a relatively small and closeted technology to something that almost anyone can now enjoy. And this is in no small part down to the introduction of digital security cameras. Analogue security was an obtrusive affair. Before digital technology, a home security system required some basic, but often large, components. There had to be cameras, limited to a ‘standard’ and not particularly high definition quality (in fact, they were lower definition than pretty much every digital camera on the market today), which were strategically positioned so as to gain a decent view of the perimeter despite the image quality limitations. There had to be a recording device, usually kept somewhere inside the house, that made use of tapes (which would often need to be changed) to record any particular night’s goings-on. Finally there had to be physical connections between these parts, as wireless technology was not yet available. Wires would often dislodge, be damaged by weather, or even be eaten through by wildlife. Lastly, if monitoring was required it would necessitate human eyes being on the video feeds at all times. Now compare and contrast a modern day digital security camera system. The cameras themselves offer incredible clarity, with even basic models giving resolutions many times greater than the best analogue versions of decades ago. These pictures are more and more often being uploaded straight to the cloud via a wireless connection the camera shares with the home’s internet router. Finally, smart software developed by security companies allows computers to identify odd goings-on in the pictures in an instant, and alert the appropriate party. Had you described that situation to a middle-income earner 2 or 3 decades ago, it’s likely that they wouldn’t believe you. Even more so when you mentioned that they could afford such a system. 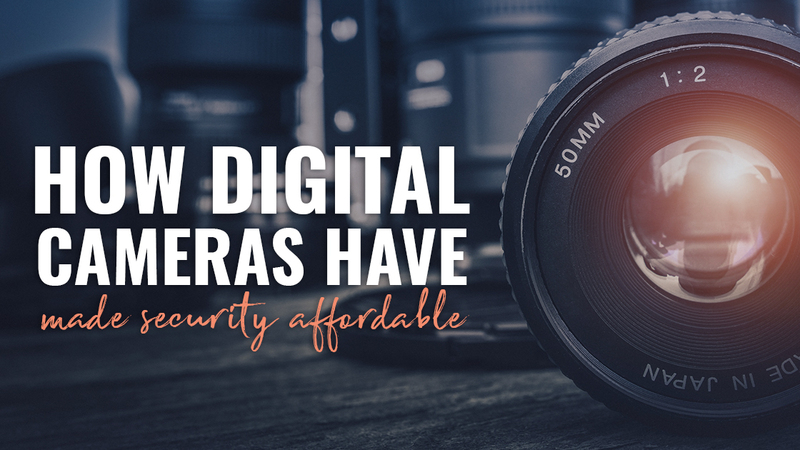 Digital cameras have changed home security in incredible ways. And it’s only when you compare today’s tech to yesterday’s that you get a true understanding of how far we’ve come. At Red Handed Security, we offer a range of security camera solutions to suit your needs and budget. Talk to our friendly team on 1300 13 40 33 to find out more.